This lovely plaid women’s mini dress is the perfect selection for daytime wear during cooler weather. 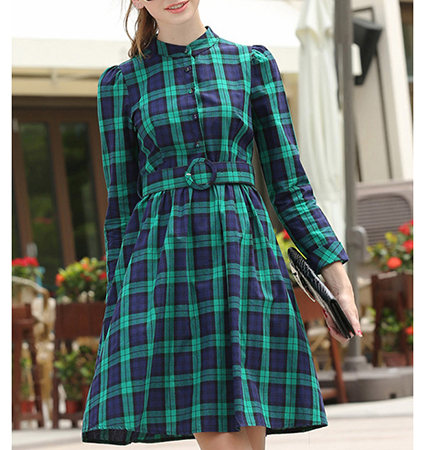 It is presented in a lovely blue and green plaid and features a small standup collar. The waistline is defined by a matching belt with a covered buckle that also matches the rest of the dress. The skirt has gentle gathers from the waist. The hemline ends well above the knees. This is a long sleeved dress with small cuffs. It zips up the back with a long, concealed zipper. It is available for purchase in sizes Small, Medium, Large and Extra Large.